Alternating air mattresses provide high levels of pressure relief to vulnerable patients, and sometimes an overlay that can be placed on top of an existing mattress can provide sufficient relief. 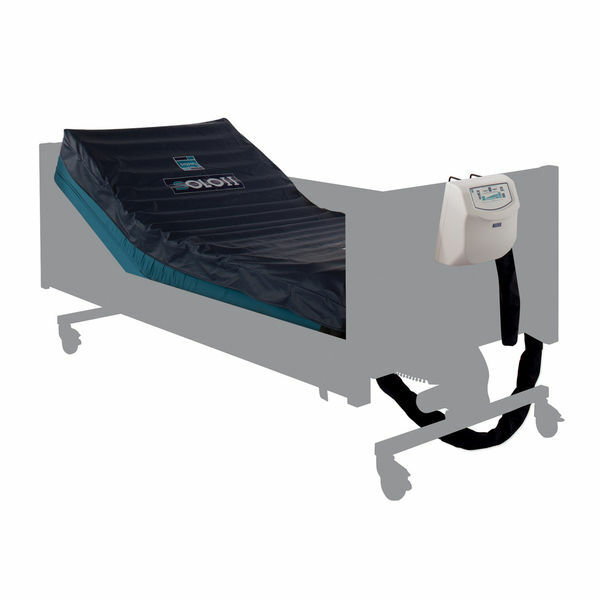 The Sidhil Solo II Alternating and Static Dynamic Pressure Relief Mattress Overlay System combines alternating dynamic therapy with static head cells, providing excellent pressure reduction while maintaining a high level of comfort and support. Designed for use on top of a profiling bed and foam underlay mattress, this overlay system is suitable for those at high risk of pressure sore development. This overlay system features 18 alternating air cells, with a two cell alternating dynamic pressure system on 12 minute cycles. This system allows the mattress to provide excellent dynamic pressure care, while static head cells provide added stability and relief. In order to adapt to any situation that arises, this mattress is operated with twin compressor control, allowing pressure to be raised or lowered quickly with little chance of error. CPR systems are also included, and transport is facilitated by a 'blanking plate' that keeps the mattress inflated throughout transfers. Please be advised that the Sidhil Solo II Alternating and Static Dynamic Pressure Relief Mattress Overlay System is usually delivered within 1 week of your order being placed. We would advise you to consider this delivery estimation before placing your order. For more information, please contact our Customer Care Team at 020 7501 0592.